Plot twist: flawless skin isn't the real standard. With our social media feeds filled with selfies of flawless, sun-kissed goddesses who tell us that drinking a lot of water and leading stress-free lives will give us blemish free skin, it's easy to believe that healthy skin equals zero flaws. According to an article in Bustle.com, "just because someone has birthmarks, occasional acne, or sun damage doesn't mean that they don't have healthy skin." We spoke to dermatologist, Dr Nomphelo Gantsho, and she confirmed that healthy skin does not necessarily mean flawless skin. "There is no such thing as flawless skin, unless you’re a baby," she says. "We all have inherent flaws in our skin. Some of us have more, and some of us have flaws that persist and besiege us. But flawless is impossible, and a futile goal. Flawless is only possible through makeup and Photoshop." "Healthy skin is more about your internal physiology – how well the invisible machinery inside your skin is running." READ MORE: Have black women been excluded from this 'perfect skin' movement? The pursuit of 'healthy' skin based on the idea of flawlessness can ultimately lead to poor skin care. According to Dr Nomphelo, one of the most common mistakes that people make when trying to attain perfect skin is that they conceal blemishes and pimples with makeup, eventually causing more harm than good. "Sometimes people don’t even remove the make up and that cause more harm to the skin," says Dr Nomphelo. "In certain instances people apply make up so thick that when they remove it its so difficult that they have to use harsh products on their skins that ended up into more blemishes post-inflammatory hyper-pigmentation." 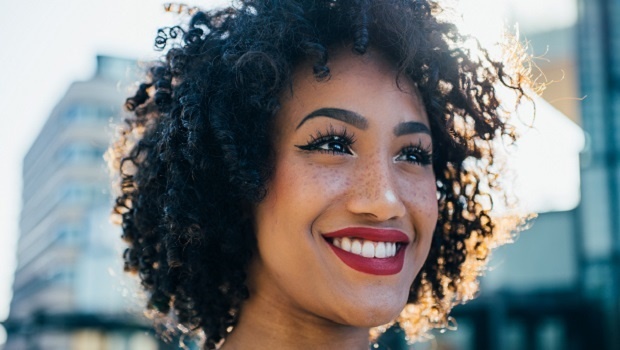 While you're trying to get rid of blemishes and spots with immediate fixes, you should be focusing on getting your skin's long-term health on fleek instead. So what does healthy skin look like? "The most defining characteristic of healthy skin, in my opinion, is the same defining characteristic of a healthy body – the ability to fight injury and disease quickly and effectively," she explains. In order to have healthy skin, you must have a strong barrier function, Dr Nomphelo adds. "Over time, a strong barrier function does lead to fewer imperfections and better-looking skin. In essence, the barrier function is your skin’s ability to resist insults. Insults can be any disturbance that causes a harmless, mild rash to a life-threatening bacterial infection." "When you have a strong barrier function, your skin is more resistant to these insults. If something bad happens to your skin, you heal faster. Someone with a weak barrier function will take longer to recover and get their skin back to normal." You don’t have to look young or perfect to have healthy skin. You can have wrinkles, sagging, pimples, blackheads, shine, dark spots, dark circles, puffy eyes, and STILL have healthy skin. All of those imperfections are normal outcomes of aging or genetic characteristics. READ MORE: Would you rather take a tiny blade or 12 micro needles to your face? Treat your skin issues. Don’t hide them because they are not going to go away without treatment. Instead of using makeup to conceal the issue, find out what the problem is and treat it accordingly. Protect your skin. A bit of sunscreen a day, keeps the dermatologist away. Also make sure that the products you use are not harsh on your skin. Moisturising also forms part of skin protection - find and use a good moisturiser to keep your skin healthy. Eat sensibly. A good diet is essential for good health - this includes good skin health. Get into the habit of eating nutritious food in order to provide your skin with the essentials it needs to thrive. Be conscious about your skin routines. Dr Nomphelo advises that you don’t over-do it on cleansing and exfoliating, and that you should avoid changing products too often - your skin might be sensitive to some or react negatively to the changes. "Introduce one new product into your skincare routine one at a time," she says.